This is insane. 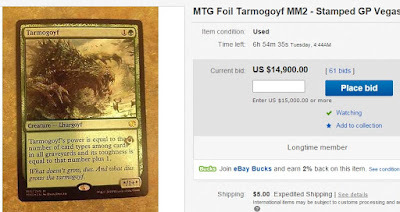 I realize that I don't need to say much more than "someone would pay $15,000 for a single card" but let me explain briefly for anyone who wants context. At a recent Magic the Gathering Grand Prix, a bunch of players were doing a draft. Drafting is a format where everyone gets random cards. You pick one card, and then pass the remaining card to pass to the player next to you. If you won the entire event, you would get $4,000 and a spot on the Magic Pro Tour. So this guy happened to open a pack of cards where one of the cards that he opened was worth about $400. Even though it didn't work well with the cards he had already taken, he took it because, well, hey, $400.